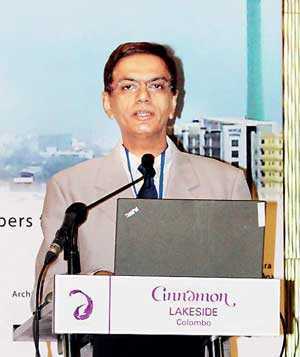 UltraTech Cement Lanka Ltd., a part of the Aditya Birla Group, facilitated the Council on Tall Buildings and Urban Habitat Sri Lanka (CTBUH) Colombo Forum 2018 which was held recently at the Cinnamon Lakeside Hotel by being the principal sponsor. The event featured a panel of presentations on tall building design and provided a compelling opportunity to network with professionals in the tall building industry. The event included a dinner and networking reception for participants spanning corporate clients and engineers in the construction field. The keynote speaker at the event was Valentine A. Lehr, Managing Member, Lehr Engineering, USA, who spoke about ‘Innovative High-Rise Building Services Designs and Solutions’ while Prof. Priyan Mendis, University of Melbourne, Australia, discussed ‘Performance Based Approaches to Fire Safety Engineering – Structural Fire Engineering’. Ultratech Cement Lanka Ltd. Senior General Manager – Marketing and Technical Sandeep Holey shared perspective of the cement industry, along with group profile. The event witnessed 120 plus participants along with Senior Management of Ultratech Cement coming together for a fruitful session. UltraTech Cement Lanka Ltd. is part of the Aditya Birla Group, which is a $ 43 billion premium global corporation from the league of Fortune 500 with operations across 36 countries and anchored by an extraordinary force of over 120,000 employees, belonging to 42 nationalities. It is a ‘metal to telecom’ conglomerate with global leadership in many of its businesses across six continents. UltraTech Cement is India’s largest cement company and the world’s third largest cement company. In Sri Lanka, it enjoys a glorious track record of operating a bulk cement terminal since 1999 with an USP of supplying superior quality cement with consistency from a single source, i.e. UltraTech Cement Ltd.’s own plant, Gujarat Cement Works, in India.